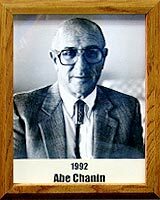 “Abe” Chanin was honored in 1988 by the Arizona Press Club for 50 years of distinguished service to Arizona journalism. In 1990 he was named to the Arizona Hall of Fame by the Phoenix Press Box Association. These are merely two of the many awards so justly earned by the man who spent so many years “in the trenches” as Sports Editor of the Arizona Daily Star. While at The Star he was instrumental in founding the Sportsman’s Fund, a program that raises money for the “Less Chance Kids” camp. Chanin has also sponsored a Little League team in Korea. Abe, the author of three books on Southwest history and 1990 Treatise on defenders of freedom of the press, is a past editor and publisher of the Arizona Post and Collegiate Baseball. A graduate of Tucson High School and the University of Arizona, Abe has also served as Director and Research Professor at the Bloom Southwest Jewish Archives located at the University of Arizona.